Pets of Skyrim is a Creation that adds five new pets, each with an ability: a fox, rabbit, goat, skeever, and spider. You can craft collars and packs to give to some of them. It was released on August 29, 2018 for 300 CC Credits. This Creation was made by Steelfeathers. 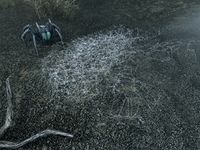 This adds five new pets to Skyrim: a fox, rabbit, goat, skeever, and spider. Each has their own ability, from greatly increased carrying capacity to the ability to spin paralyzing web traps. Some can also be given collars and packs, which can be crafted. This Creation adds a long quest to obtain five non-combat pets: a blue frostbite spider that can spin web traps, a pack goat, a skeever that can locate food, a fox that can look for valuable loot, and a beige rabbit that can look for plants to harvest. Information on each pet is included in the journal of its previous owner. This Creation also adds the ability to craft Animal Collars and Animal Packs using leather and leather strips. Other than the spider, each pet can be given a collar. However, only the goat and skeever can be equipped with a pack. This page was last modified on 6 December 2018, at 19:39.